I picked up this tray ages ago at a thrift store with the intention of doing something cool with it. 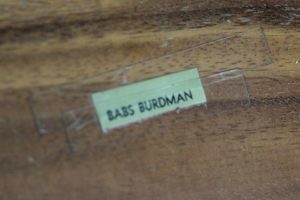 The tray has a typed name taped to the back, and I imagine that the previous owner, Babs, would load this tray up with lemon bars or deviled eggs and take the treats to her bunco parties. But the tray was pretty beat up, and it’s finally time for this tray to make some appearances at parties again. 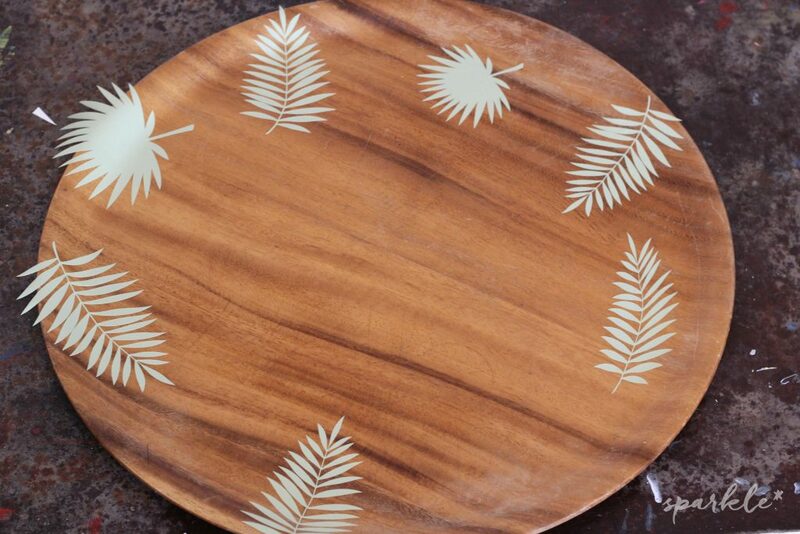 This tray needed some Mid-Century/tropical feel. 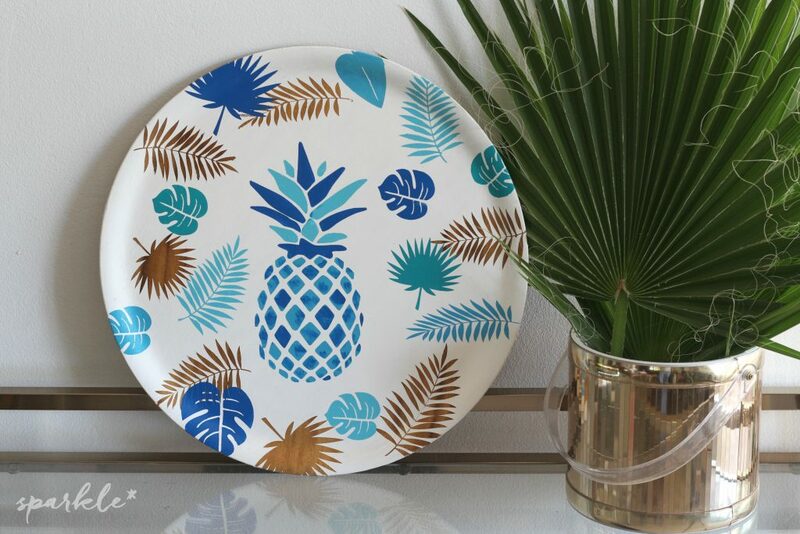 Yup and what’s more tropical than a blue pineapple? Nothing, of course. A blue pineapple has the sweetness of a pineapple and the cool blue of the ocean. Yeah, that was a reach. Anyhow I wanted the original wood grain to peek through to add a mid-century feel to the tray. 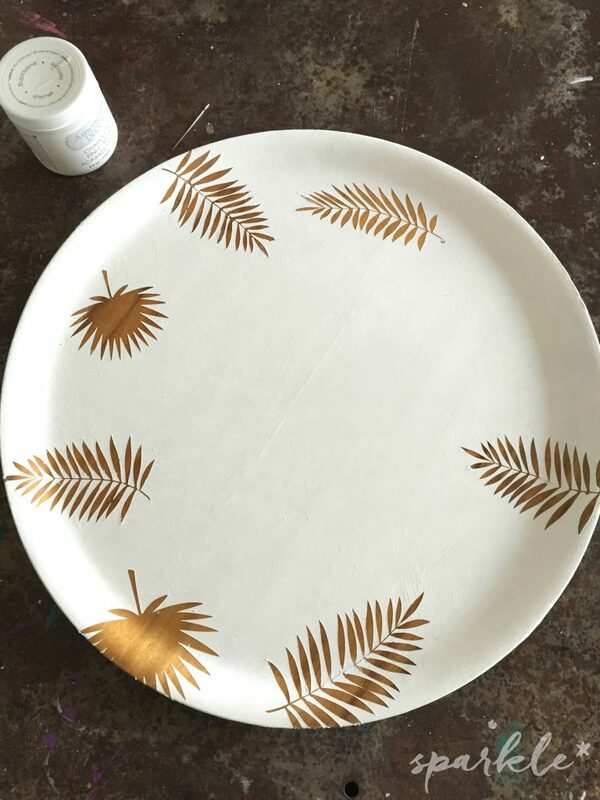 I made the stencils out of adhesive vinyl using my Silhouette Cameo and my favorite DecoArt acrylic paints to make this serving tray gorgeous. Start by using the cutting machine to cut the tropical leaves out of vinyl, make them in a variety of sizes and shapes to add interest. Stick the inside of the cut shape on to the tray, making sure to leave room for the gorgeous pineapple in the middle. 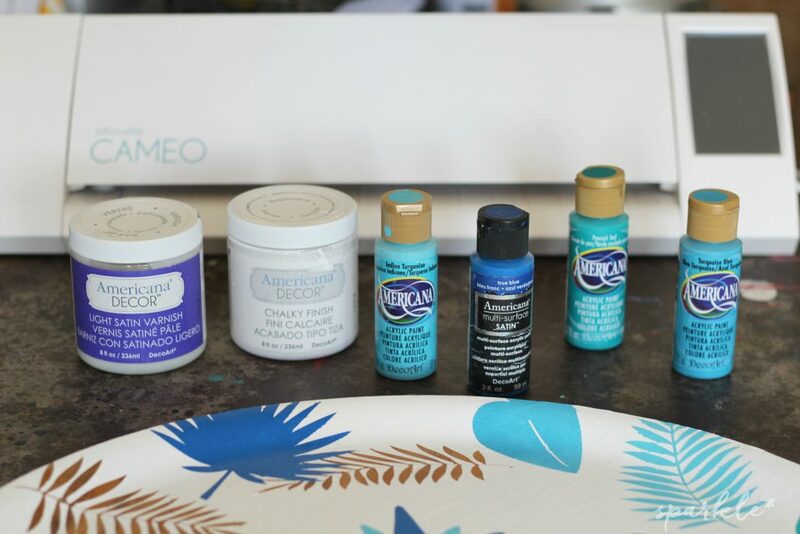 Paint over the tray with two or three layers of the chalky finish paint using a foam brush. 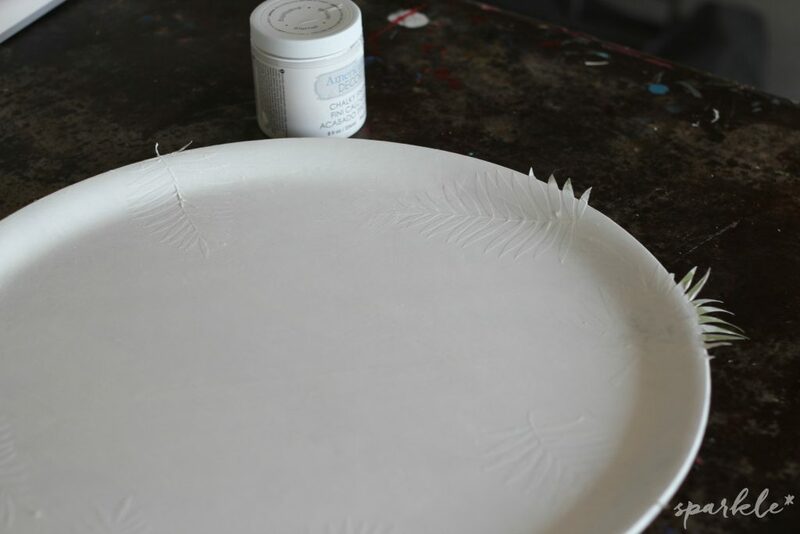 Once the paint has adequately covered the tray and is dry, carefully peel the vinyl off. It might help to use tweezers if it’s hard to get to the vinyl under the paint. 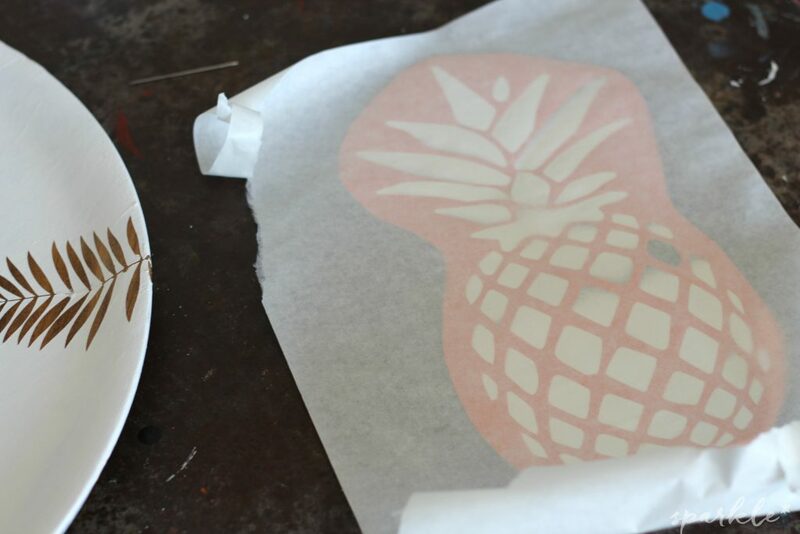 At this point use the transfer paper to attach the negative cut of the pineapple to the tray. Carefully peel off the transfer paper from the tray and make sure the vinyl is smoothly attached. Add the negatives of leaves so they appear scattered all around, and layer them. 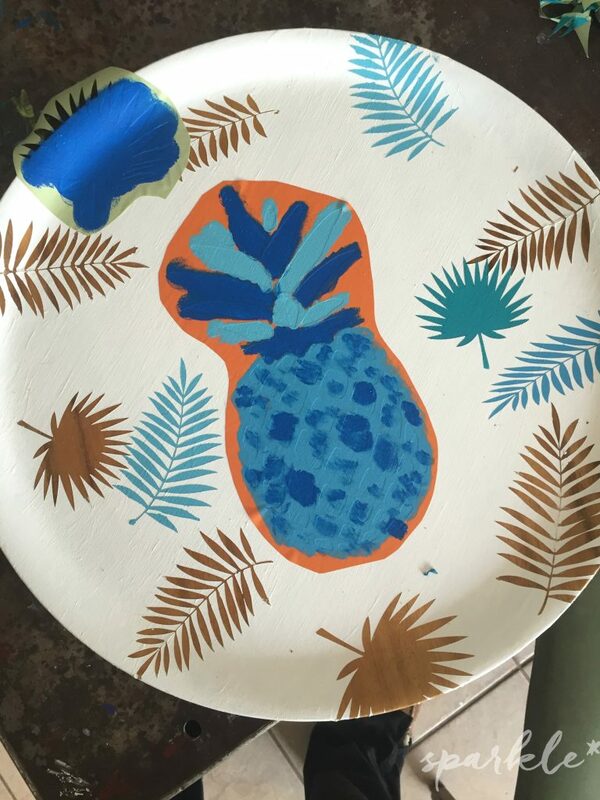 Use the pouncers to carefully add paint to the leaves and the pineapple. I added layers of color to the pineapple. After the paint is dry, feel free to add more layers of leaves, until it feels finished. Add two coats of the satin varnish to protect the beautiful paint. The varnish is not food safe, so don’t place food directly on the tray. Glad you love it Carol! 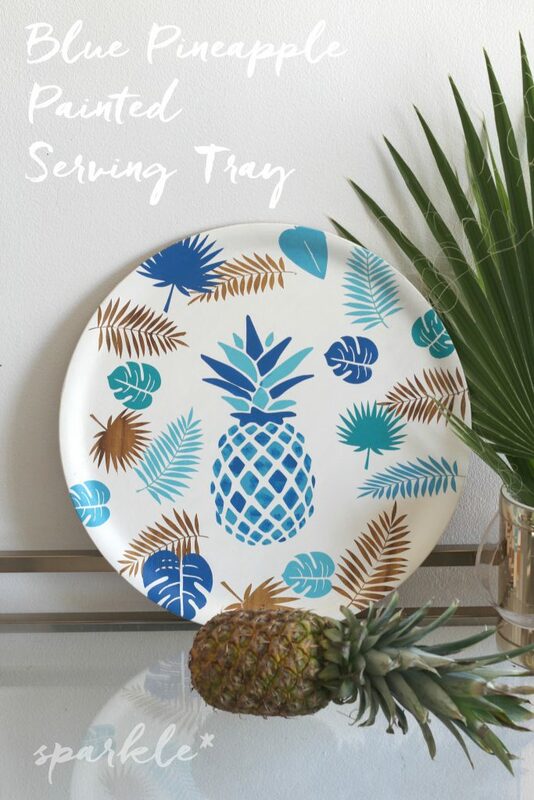 Love this have pinned to my pineapple board. I’m glad you love the plate Lorrainne! Thank you for stopping by! Beautiful job! Love how this turned out. Pinning to share. Thank you for sharing your post with us this week at Snickerdoodle Sunday! I see these trays thrifting all the time. Great upcycle! How cute is this! 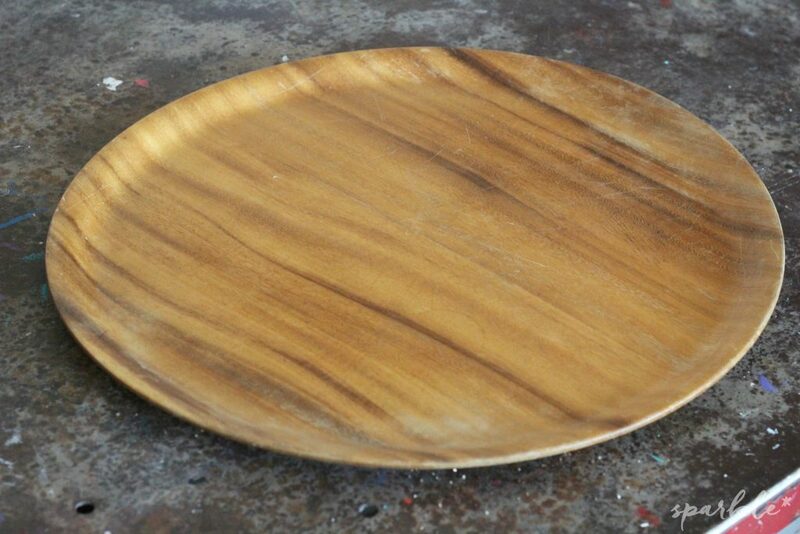 I’m sure I’d pass a tray like this right by if I saw it in a second hand store and you have given it such new life! Thanks for sharing with us on Throwback Thursday! Jes, Love your serving tray! Thanks for sharing your DIY at the Inspiration Spotlight party. Pinned & shared. See you again soon. This.is.ADORABLE! I can’t wait to make my own. It’s just too stinking cute. Love the plate! Love all the colors you picked. Blue totally works on the plate and does give a cool vibe. This looks awesome! I love a good thrift flip…I am pinning this for later. I went ahead and followed you on FB and Pinterest too…lovely summer DIY! What a cute retro makeover! Thanks for sharing at Home Sweet Home! This is such a great idea! I am happy to be featuring you at TFT this week. I hope you will join us again by sharing your creative ideas at this week’s party too. Have a great weekend!